Our No Goats No Glory shirt is a really cool way to remember the movie. It's been extremely popular in the few week's we've offered it and for good reason. The film is an instant classic that is beyond hysterical and fascinating as a true life story. Our No Goats No Glory shirt prints beautifully on any style or color shirt you choose and we have over a hundred different combinations to select so you are assured of finding just the right shirt you want. 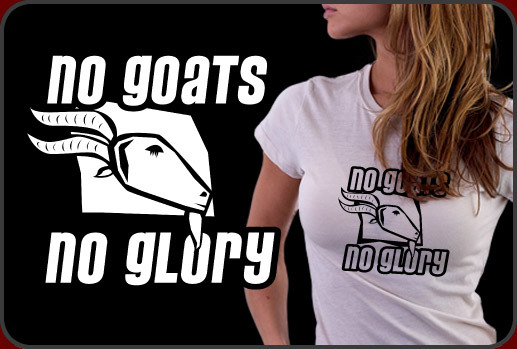 We have lots of cool styles and colors of No Goats No Glory shirts avialable in men's, women's and children's shirts. We also have included a few No Goats No Glory gift items such as buttons, stickers, bags and more. Click the button on the left to view a small sampling of what we have to offer.